Download "Croeso / Welcome. 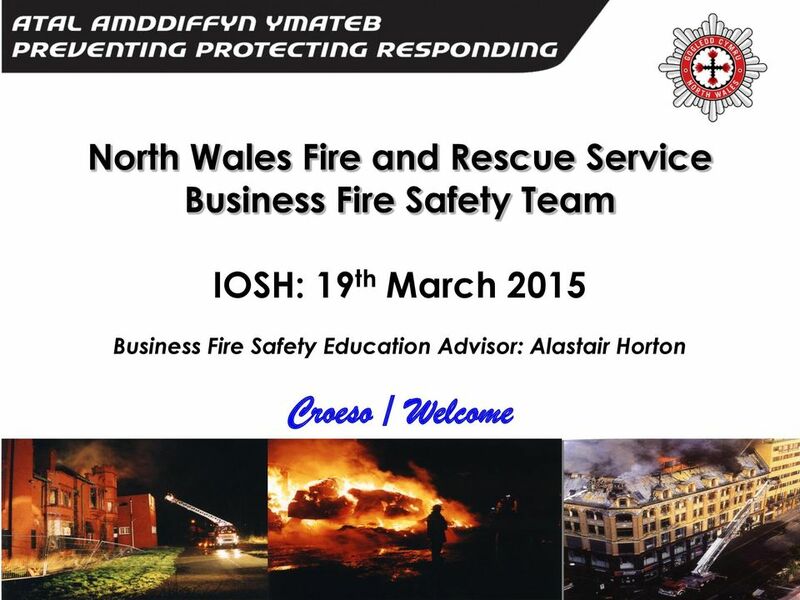 North Wales Fire and Rescue Service Business Fire Safety Team. 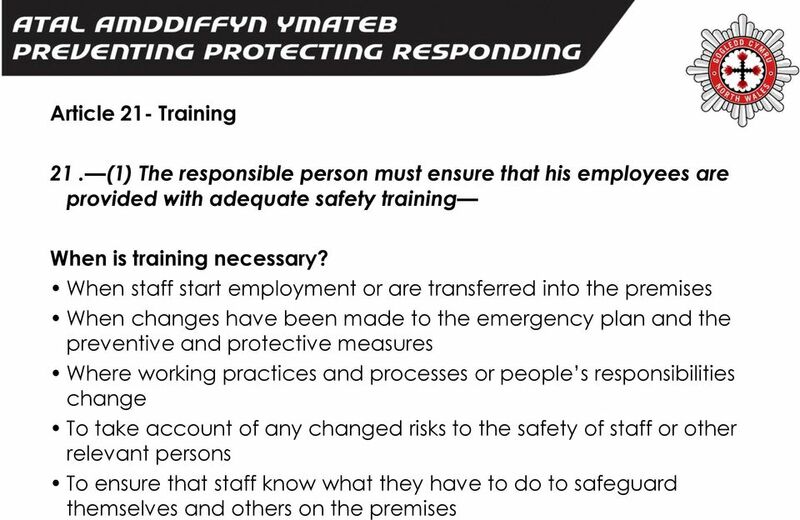 IOSH: 19 th March 2015"
3 The Audit: Part A The responsible person (limited company? ), contact details, registered address etc and person providing the information. Physical features of the building- storeys, construction etc. Occupancy: Max. number of people and persons sleeping on the premises. Times of occupancy. Service isolation points: Gas, electric, water, oil etc. Fire-fighting facilities fire fighting shafts, fire fighting lift. Dry risers/ wet risers. Smoke control. Sprinkler system. Fire Warning system- is it adequate? Is it linked to a monitoring company? Location of control panel etc. History of incidents including unwanted signals in the last 3 years. Exceptional circumstances? Heritage risk- listed building? Community loss- large employer in the area? 4 Property loss: Likely spread of fire within the building and beyond. 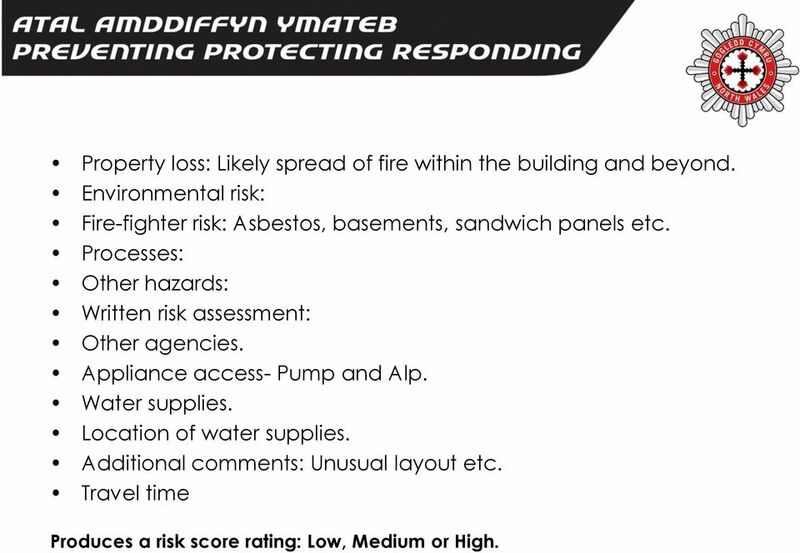 Environmental risk: Fire-fighter risk: Asbestos, basements, sandwich panels etc. Processes: Other hazards: Written risk assessment: Other agencies. Appliance access- Pump and Alp. Water supplies. Location of water supplies. Additional comments: Unusual layout etc. Travel time Produces a risk score rating: Low, Medium or High. 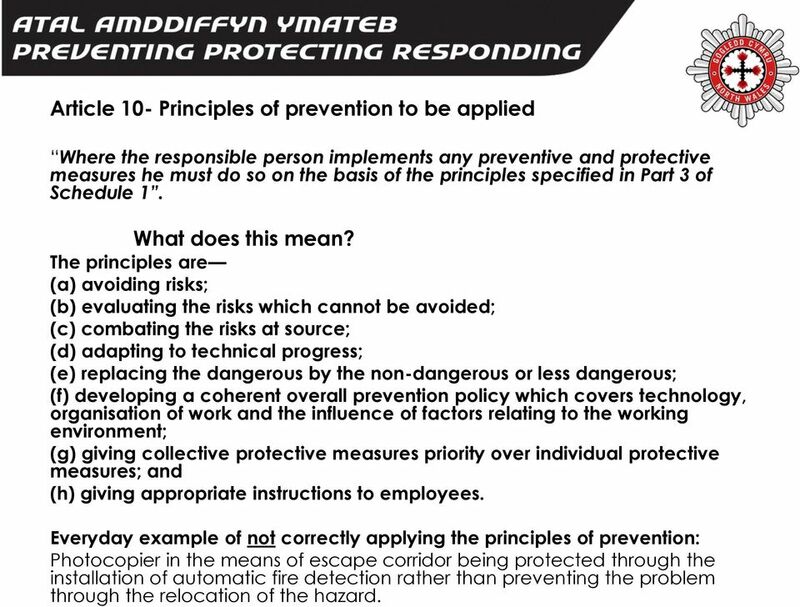 7 Article 10- Principles of prevention to be applied Where the responsible person implements any preventive and protective measures he must do so on the basis of the principles specified in Part 3 of Schedule 1. What does this mean? The principles are (a) avoiding risks; (b) evaluating the risks which cannot be avoided; (c) combating the risks at source; (d) adapting to technical progress; (e) replacing the dangerous by the non-dangerous or less dangerous; (f) developing a coherent overall prevention policy which covers technology, organisation of work and the influence of factors relating to the working environment; (g) giving collective protective measures priority over individual protective measures; and (h) giving appropriate instructions to employees. 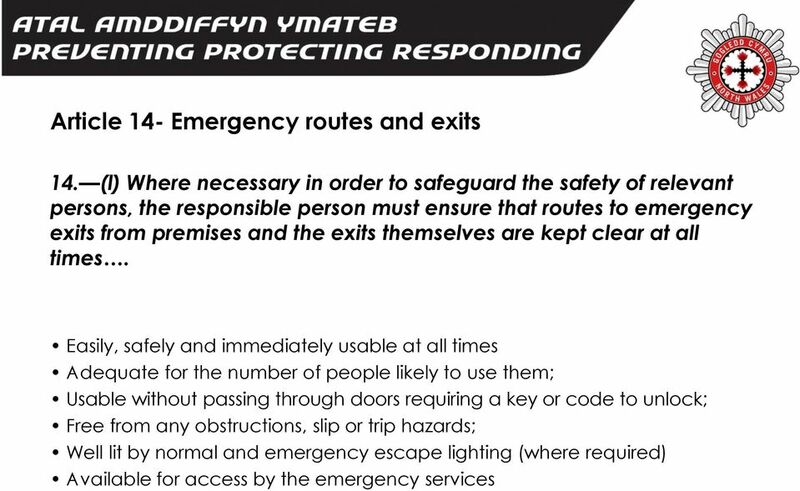 Everyday example of not correctly applying the principles of prevention: Photocopier in the means of escape corridor being protected through the installation of automatic fire detection rather than preventing the problem through the relocation of the hazard. 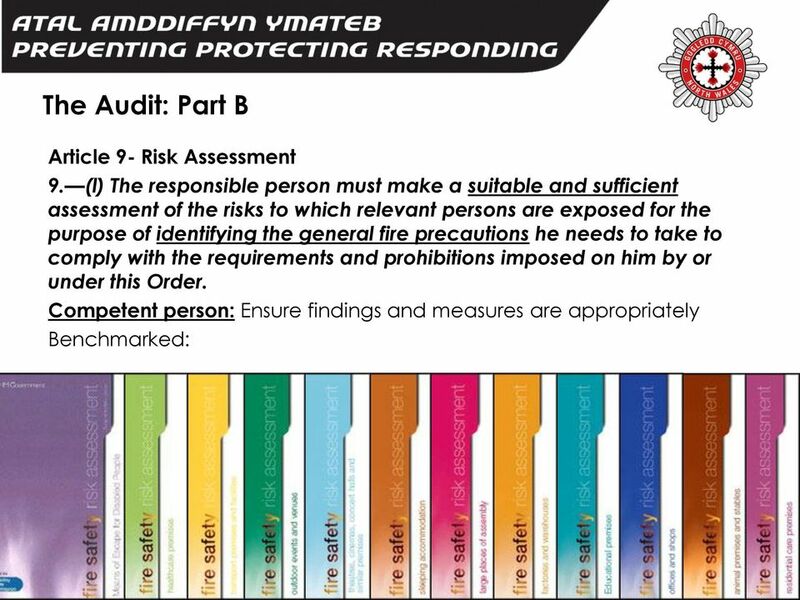 8 Article 11- Fire Safety Arrangements Typically demonstrated via a Fire Safety Policy: Statement- Organisation- Arrangements A typical fire safety policy, for example, should: a) Detail the intentions of the premises to keep relevant persons as safe from fire as possible by taking reasonably practicable measures to reduce the risk of a fire starting and fire spreading (and through demonstrating compliance with current fire safety legislation). b) Outline responsibilities of individuals. 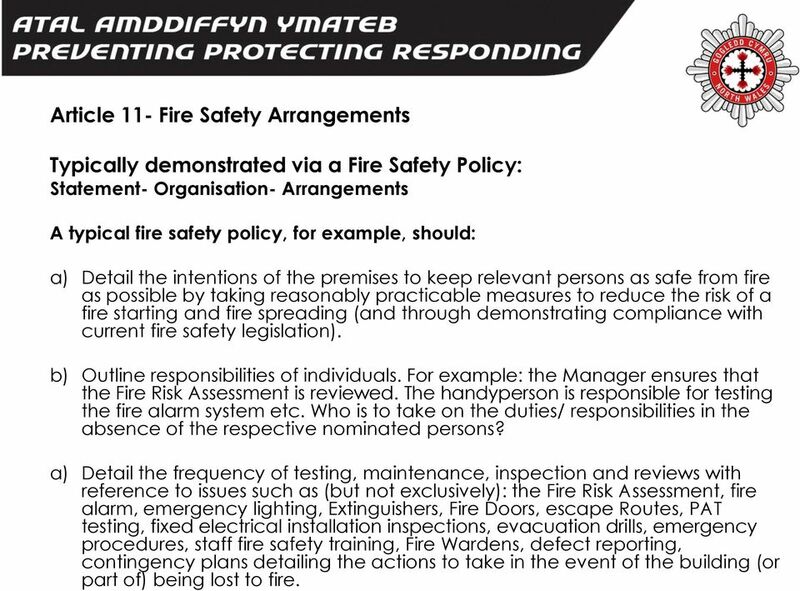 For example: the Manager ensures that the Fire Risk Assessment is reviewed. The handyperson is responsible for testing the fire alarm system etc. Who is to take on the duties/ responsibilities in the absence of the respective nominated persons? 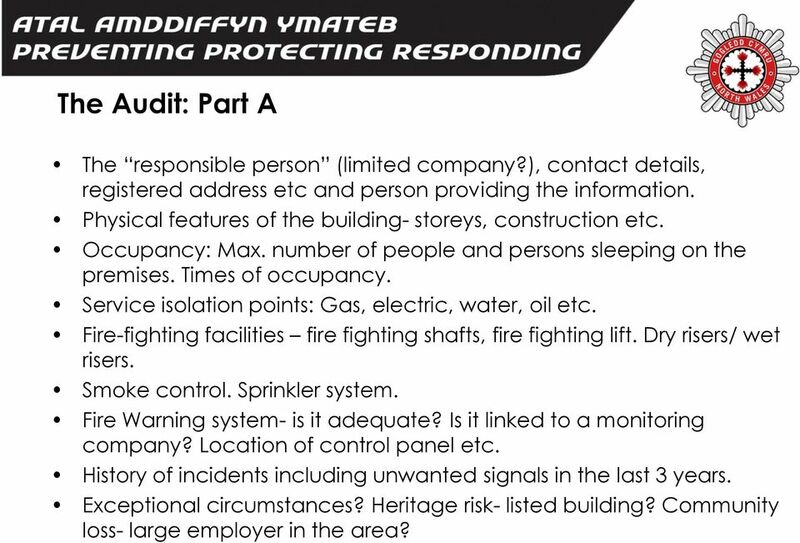 a) Detail the frequency of testing, maintenance, inspection and reviews with reference to issues such as (but not exclusively): the Fire Risk Assessment, fire alarm, emergency lighting, Extinguishers, Fire Doors, escape Routes, PAT testing, fixed electrical installation inspections, evacuation drills, emergency procedures, staff fire safety training, Fire Wardens, defect reporting, contingency plans detailing the actions to take in the event of the building (or part of) being lost to fire. 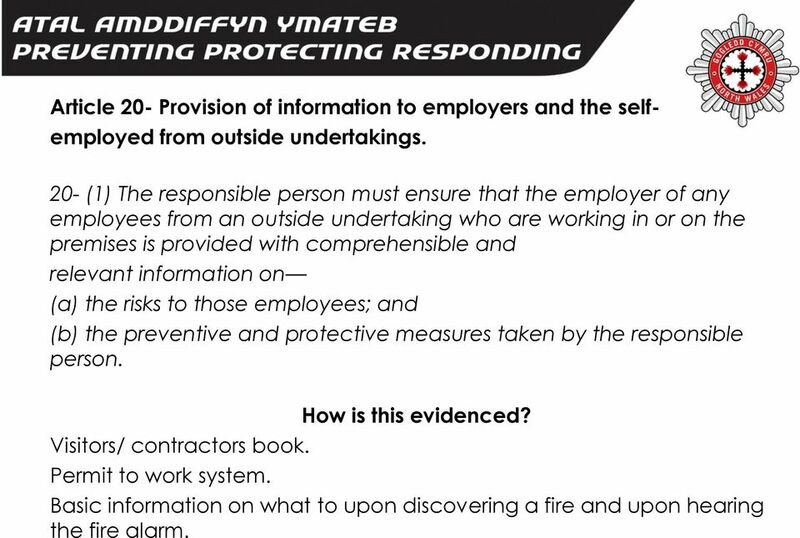 11 Article 20- Provision of information to employers and the self- employed from outside undertakings. 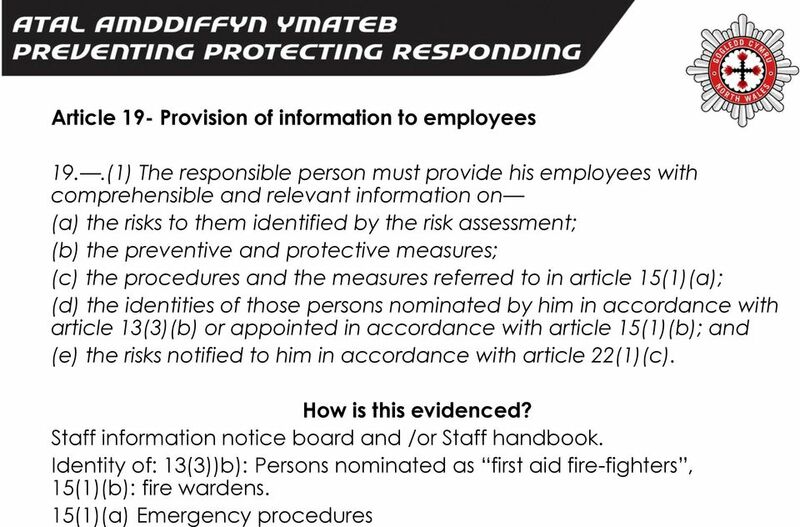 20- (1) The responsible person must ensure that the employer of any employees from an outside undertaking who are working in or on the premises is provided with comprehensible and relevant information on (a) the risks to those employees; and (b) the preventive and protective measures taken by the responsible person. Visitors/ contractors book. Permit to work system. How is this evidenced? Basic information on what to upon discovering a fire and upon hearing the fire alarm. 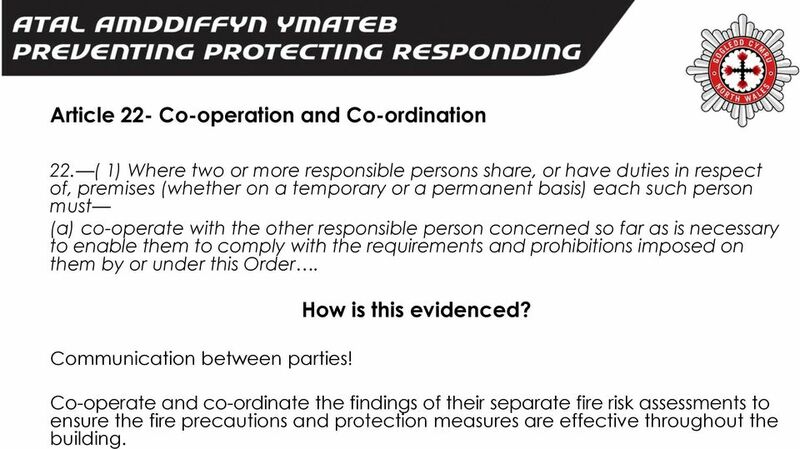 12 Article 22- Co-operation and Co-ordination 22. ( 1) Where two or more responsible persons share, or have duties in respect of, premises (whether on a temporary or a permanent basis) each such person must (a) co-operate with the other responsible person concerned so far as is necessary to enable them to comply with the requirements and prohibitions imposed on them by or under this Order. Communication between parties! How is this evidenced? 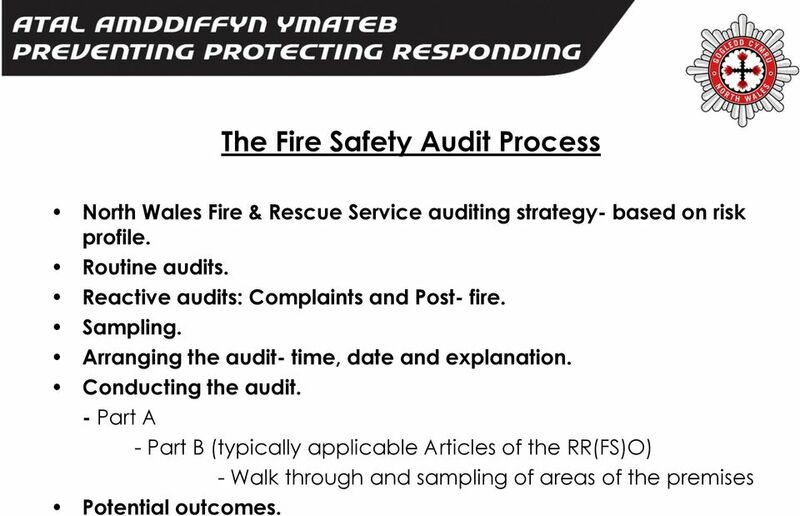 Co-operate and co-ordinate the findings of their separate fire risk assessments to ensure the fire precautions and protection measures are effective throughout the building. 14 What should fire safety training include? This can vary depending on the type of premises. What to do on discovering a fire; What to do upon hearing the fire alarm; Procedures for alerting members of the public and visitors including, where appropriate, directing them to exits; The arrangements for calling the fire and rescue service; The evacuation procedures for everyone to reach an assembly point at a place of total safety; The location and, when appropriate, the use of fire-fighting equipment; The location of escape routes, especially those not in regular use; How to open all emergency exit doors; The importance of keeping fire doors closed to prevent the spread of fire, heat and smoke; Where appropriate, how to stop machines and processes and isolate power supplies in the event of a fire; The importance of general fire safety, which includes good housekeeping. 15 Article 18- Safety Assistance 18. (l) The responsible person must. appoint one or more competent persons to assist him in undertaking the preventive and protective measures. What does this mean? 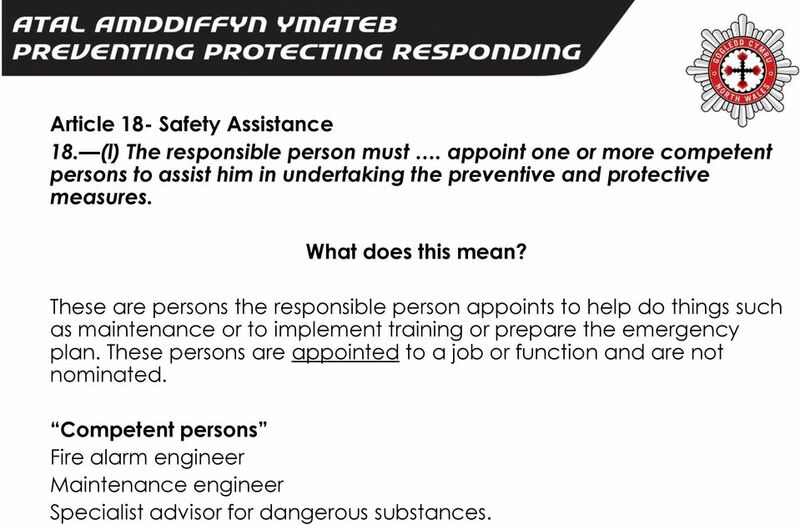 These are persons the responsible person appoints to help do things such as maintenance or to implement training or prepare the emergency plan. These persons are appointed to a job or function and are not nominated. 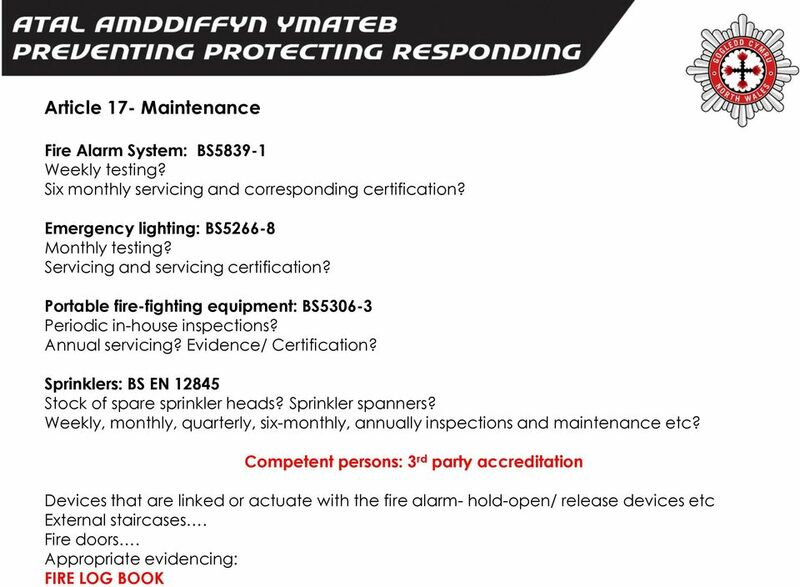 Competent persons Fire alarm engineer Maintenance engineer Specialist advisor for dangerous substances. 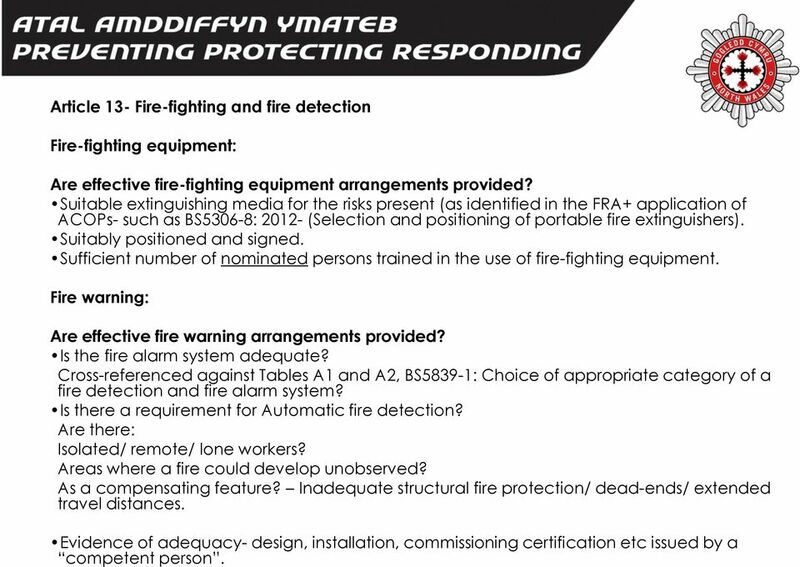 17 Article 13- Fire-fighting and fire detection Fire-fighting equipment: Are effective fire-fighting equipment arrangements provided? Suitable extinguishing media for the risks present (as identified in the FRA+ application of ACOPs- such as BS5306-8: (Selection and positioning of portable fire extinguishers). Suitably positioned and signed. Sufficient number of nominated persons trained in the use of fire-fighting equipment. Fire warning: Are effective fire warning arrangements provided? Is the fire alarm system adequate? Cross-referenced against Tables A1 and A2, BS5839-1: Choice of appropriate category of a fire detection and fire alarm system? Is there a requirement for Automatic fire detection? Are there: Isolated/ remote/ lone workers? Areas where a fire could develop unobserved? As a compensating feature? 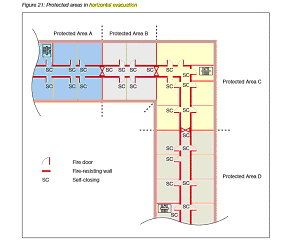 Inadequate structural fire protection/ dead-ends/ extended travel distances. Evidence of adequacy- design, installation, commissioning certification etc issued by a competent person. 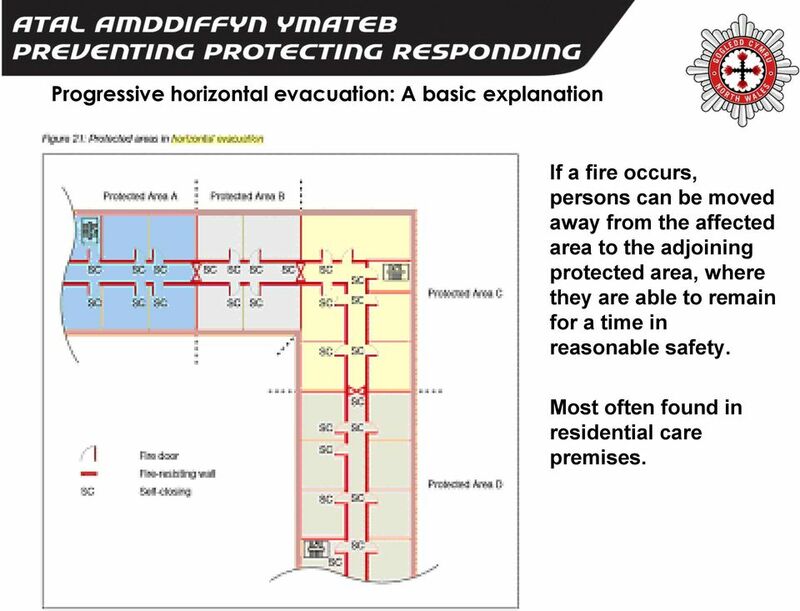 19 Progressive horizontal evacuation: A basic explanation If a fire occurs, persons can be moved away from the affected area to the adjoining protected area, where they are able to remain for a time in reasonable safety. Most often found in residential care premises. 23 May 2014: Morven House Care Home, Croydon Inspection conducted following concerns raised by Care Quality Commission. Blocked escape routes on the ground floor. Building work taking place- only escape route was via the lounge at the rear of the premises- front door had been boarded up, whilst alternative exit had been bricked up. External escape stairs from second floor inaccessible due to scaffolding and too steep for residents. External escape stairs from first floor- inaccessible due to scaffolding. Failure to keep an up to date fire risk assessment. Lack of emergency plan. Inadequate fire alarm and detection system. Morven Healthcare Ltd incurred fines totalling 45,000 with full court costs of 23,000. 24 July 2011, The Dial Hotel and Market Inn, Mansfield Believed to be the first successful prosecution of a fire risk assessor John O Rourke -Mansfield Fire Protection Services, Mansfield, was jailed for 8 months and was ordered to pay 5, after he pleaded guilty to two breaches of Fire Safety requirements in relation to the inadequacy of Fire Risk Assessments he provided. inadequate fire doors at the premises compromising exit routes an emergency exit was locked emergency lighting at the premises was inadequate inadequate fire detection at the premises fire extinguishers were not sufficiently maintained the fire alarm and emergency lighting were not sufficiently maintained. 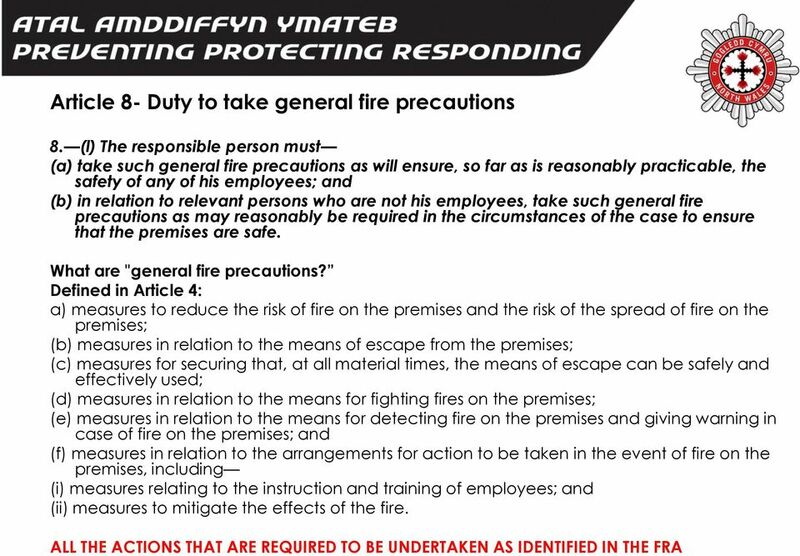 Article 5(3) of the Regulatory Reform Fire Safety Order places a duty to comply with the Order on persons other than responsible persons under Article 3 to the extent that they have control of premises. Article 5(4) makes clear that when a person has by virtue of any contract or tenancy an obligation for the maintenance or repair of premises, or the safety of the premises they will be treated as a person who has control of the premises to the extent that their obligation so extends. 25 Diolch Cwestiynau? Any Questions? Housing Act 2004 Regulatory Reform (Fire Safety) Order 2005 Fire Safety in Purpose-Built Flats Have you taken sufficient action?